Yarrow is a perennial herb. It is found world wide and grows almost in all places. Although native to Europe and Asia, yarrow became naturalized in North America as well as other countries worldwide. Throughout the eastern and central United States and Canada, yarrow is commonly found along roadsides, in old fields, pastures, and meadows. The yarrow basal leaves are sometimes quite large and sprawling, always on long petioles, and initially grow in a rosette. When coming into flower, the stem leaves become shorter, sessile, and alternately spaced. Yarrow blooms from June, with furrowed, flowering stems, typically reaching heights of 60-70cm. Often referred to as 'umbel-like'; the untrained eye could initially mistake yarrow's flowering structure for an umbel, and place yarrow in the carrot family. Yarrow is used for fever, common cold, hay fever, absence of menstruation, dysentery, diarrhea, loss of appetite, gastrointestinal (GI) tract discomfort, and to induce sweating. Some people chew the fresh leaves to relieve toothache. In foods, the young leaves and flowers of yarrow are used in salads. In manufacturing, yarrow is also used as a cosmetic cleanser and in snuff. Yarrow oil is used in shampoos. In ancient folklore, yarrow, which was considered to be dedicated to the Evil One, also inherited the nicknames Devil’s Nettle, Devil’s Plaything, and Badman’s Plaything. At one point in history, Achilles, a Greek hero of the Trojan War, used this plant to heal his soldiers, which explains why it is also referred to as Soldier’s Woundwart. It is said that he learned this remedy from his mentor, Chiron the Centaur. After Achilles introduced this herb to the battlefield, it was used constantly up until the time of the Civil War. During this time period, the plant was crushed and applied to bullet and shrapnel wounds. Yarrow was supposed to be extremely effective in healing wounds, especially those that were caused by iron weapons. Some believed they could be protected from evil by burning yarrow on the eve of St. John’s Day. Others believed that good health in the coming year would be guaranteed if a bundle of yarrow was tied together and hung over a doorway or over an infant’s cradle on Midsummer’s Eve. Druids used the stems to assist in foretelling the weather and the Chinese used the stems to see into the future. Many young girls burned yarrow and chanted, “Good morning, good morning, good yarrow, and thrice good morning to thee. Tell me, before this time tomorrow, who my true love is to be,” in hopes of discovering the identity of their future husband. The importance of yarrow in ancient history can especially be seen with the discovery of a 40- to 60,000-year-old Neanderthal whose remains were found holding yarrow among other herbs. Researches have established yarrow to be an excellent herb to heal abscesses (a localized collection of pus in the tissues of the body). When yarrow is blended with other herbs, it helps in healing colds and flu. The herb's sour stimulant possessions render it helpful in promoting poor digestion and colic (a disease characterized by severe pain in the intestines owing to various affections of the gastrointestinal tract). 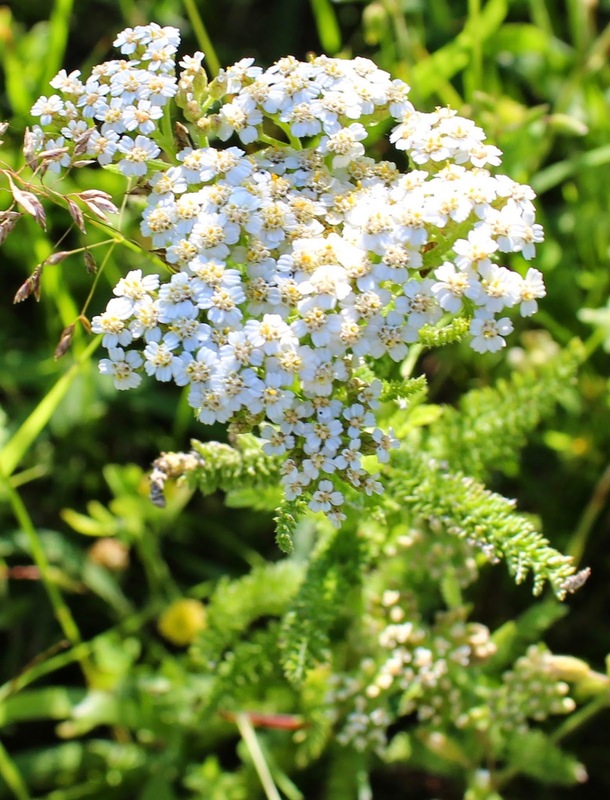 In addition, yarrow is also effective in healing hay fever, lowering high blood pressure, enhancing blood circulation in the veins, and taunting up swollen or knotted veins. When applied externally, yarrow is also useful as a herbal cleanser for skin wrinkles. Fights bacteria. Yarrow has an antiseptic action. The bitter parts and fatty acids encourage bile flow out of the gallbladder, known as the cholagogue effect. The free-flowing action improves digestion and prevents and gallstones from forming. Yarrow contains a drying effect and seems to improve coughs and sinus infections with sputum formation. Yarrow is used to aid in healing skin conditions, such as eczema. The essential oils are used and rubbed onto the affected area. Anti-inflammatory. 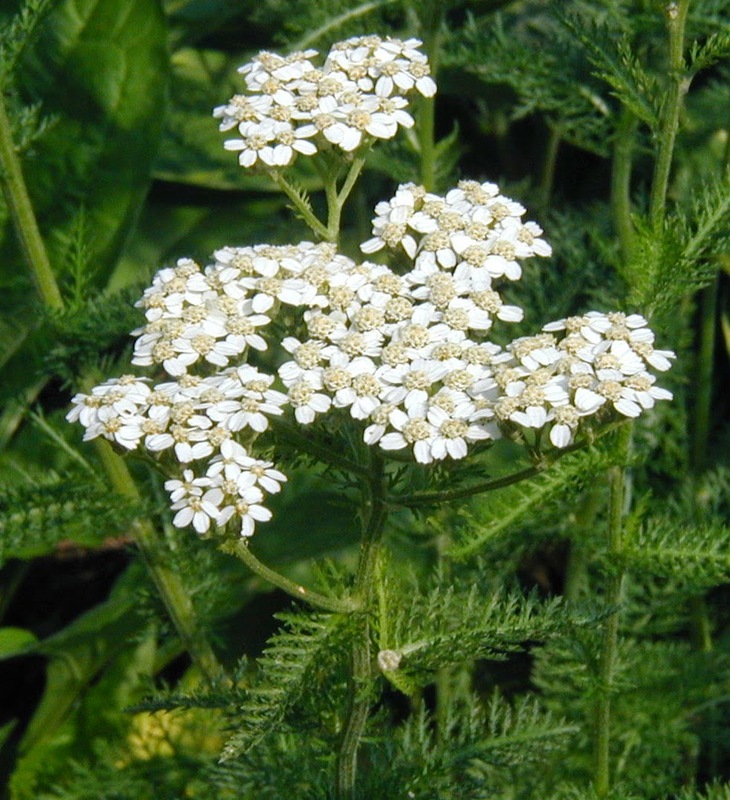 The oil found in the yarrow has been used to treat arthritis. Expectorant. Helps to cure colds. Promotes digestion. Helps in the secretion of enzymes and digestive juice and increases appetite; both help in digestion. The leaves of the yarrow can be used cooked or raw. They have a bitter flavor but are good in mixed salads and best used when they are young. The leaves may also be used as a preservative or flavoring for beer. The flowers and leaves can be made into an aromatic tea and the essential oils found in the flowering heads can be used as flavor for soft drinks. Caution should be exercised when using yarrow if the person has an allergy to ragweed. Avoid use if there are gallstones present. An allergic skin rash or skin sensitivity to light may be caused by extended use of yarrow whether it is being used medicinally or in the diet. If you have allergies, be sure to check with your healthcare provider before taking yarrow. Yarrow use may also alter estrogen activity. Women who experience heavy periods or who have pelvic inflammatory disease should not use yarrow. 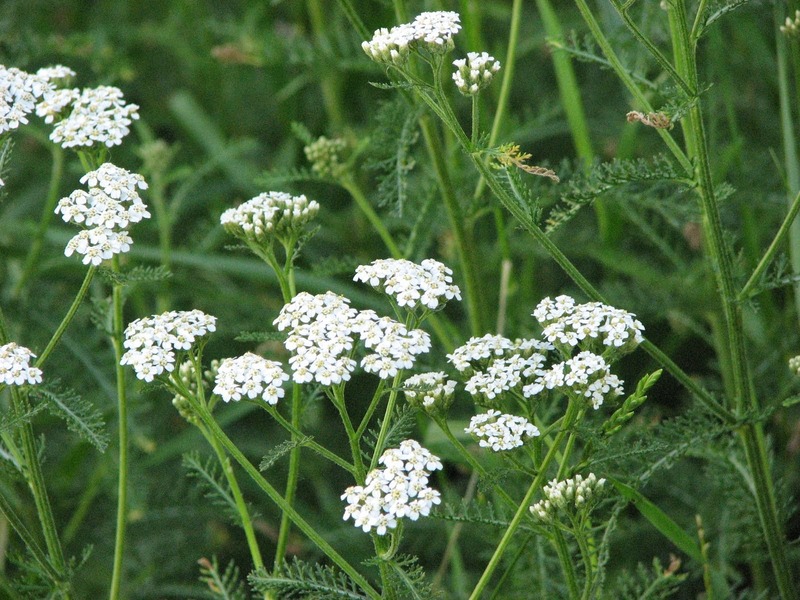 Even though yarrow is used to treat wounds, it still should not be used to treat large, deep, or infected wounds. The actual leaves of the yarrow plant should never be used alone internally.